This year, 2014, is a very special year for Anglo-Japanese relations. The little-known tale of John Saris, Captain of The Clove, and his journey 400 years ago is an epic one. He set sail for Japan in 1611 with a commission from King James I to establish formal relations with the Shogun. Successfully, he returned in 1614, landing in Plymouth on 27th September with gifts and a Vermillion seal letter from the Shogun, Ieyasu Tokugawa to King James I, which granted the English permission to live and trade throughout Japan. “Japan 400 Plymouth” was initiated out of Plymouth University to celebrate the 400th anniversary of Anglo-Japanese relations. This event provided a rich variety of programmes from Japanese art and culture to cuisine. 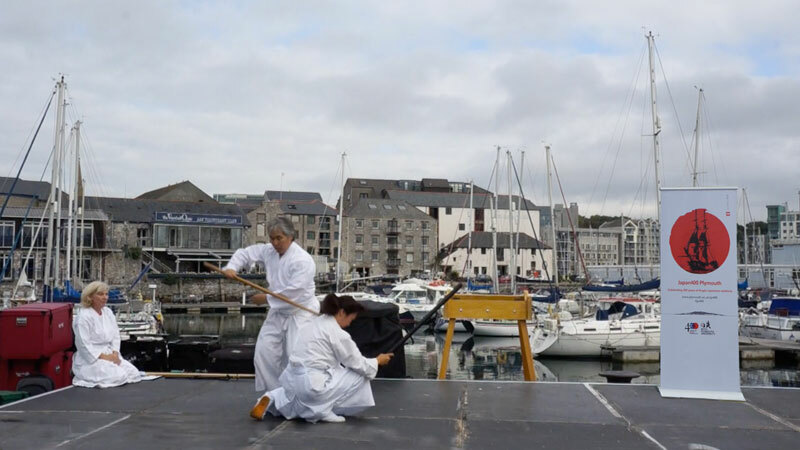 Last year Minagawa sensei and Pam were contacted by Adam, who used to practice Shintaido in the 80’s and now teaches choreography in the Performing Arts programme at Plymouth University. He asked them for a Shintaido demonstration and also to give an introductory workshop at this event. I was invited to be part of this project. Prior to the event, we got together to brainstorm what to present at the demonstration and began to formulate a programme, which was revised and refined several times through rehearsing till it was finalised. It was a great learning opportunity for me to witness and also be part of this creative process. In the early hours of the 27th September, after having a final rehearsal in the living room at Minagawa family’s house the previous night, we left Bristol before the sunrise. Through the early morning mist, Pam drove us safely to Plymouth. It was a beautiful Saturday morning in Plymouth with a fresh sea breeze blowing in the air. On our way to the Barbican where the demonstration took place, the town was rather quiet and we started to wonder if there would be anyone coming to see our demonstration. Just then, we came across a group of Japanese ladies. Minagawa sensei frankly began a conversation and discovered that one of the ladies who was a potter living in Dartmoor had known a Shintaido Instructor in Japan who was also a potter living in Mashiko! Through this conversational kumite, the ladies started to show their interest in Shintaido and in the end they all promised to come and see the demonstration. Here I have to confess that I must have missed a sign pointing to Barbican and a turning at this point in spite of the fact that I had a map in my hand, ended up causing us all to walk at least an extra mile till finally we found our way to Sutton Harbour just 30 minutes before the time for the demonstration! To our surprise, the harbour was buzzing with lots of people, and the stage was set right in the middle of the harbour where the home coming of The Clove would be taking place later that afternoon, recreating the scene which had occurred exactly 400 years ago on this day! There, Adam and his Japanese wife, Tamayo, with their 3 beautiful children greeted us. Before we did the last minute stage rehearsal, Minagawa sensei cleansed the stage with his sword, which helped me to feel safe to perform and also helped to calm my nerves. The demonstration was opened with Pam’s introduction of Shintaido, explaining its origin and history briefly as well as the uniqueness of Shintaido. By this time the stage was surrounded with quite a large audience and I could see still more people were coming to see what was happening on the stage. After the introduction, I started to do Tenshin goso “Cycle of Life” both sei and expansive dai form. While I was performing this, my mind had the overwrapping image of the epic journey of The Clove sailing to the Far East and completing the return cycle of journey. Pam and I performed Tenshin goso Kumite together following this. Then we moved on to Bo-jutsu kihon (basic) contrasting with open hands Toitsu kihon movements, performed next to each other, followed by a graceful Bojutsu 2 dan kata (form) “Sakugawa” performed by Pam. Minagawa sensei appeared at this stage to perform 4 hon kumibo and Soei kumibo with Pam, which have dynamic movements with corresponding images such as “Big Lightening”, “Crashing Waves”, “Ascending to the sky” and to the final rather delicate image of “Peeling back petals”. The last section of the demonstration was Kenjutsu/ Sword techniques and Tenshin goso applications. Under the Master’s gorei, I performed Kyu kajo, the 9 fundamental sword techniques. Minagawa sensei and I then did Kyukajo Kumitachi sword applications followed by free Kumitachi. Then we put our swords aside, and Pam and I attacked Minagawa sensei first with grabbing his wrist, then with tsuki (punching) and finally with Uchite (open hands striking) attack. This was done as completely free style, where Minagawa sensei gracefully received with various Tenshin goso applications. Finally Minagawa sensei took his genuine Samurai sword out, and did some fundamental movements, Diamond eight and Shoden no kata, which is the latest sword form based upon Tenshingoso application sword movements. Through this final performance, I felt stillness and a sense of peace filling the space around. Looking back, I realise that all the preparation and rehearsals supported me tremendously on the stage. I was really grateful for Minagawa sensei and Pam’s support and advice all the way through. After spending a free afternoon to enjoy the event (by this time the rest of my family had arrived in Plymouth) and taking a walk in the famous Hoe gardens with the view of the harbour and Drake Island in the distance, we had a final discussion to prepare for the workshop the next day. Minagawa sensei shared his 2 methods on how to introduce Shintaido at a workshop. In both methods, he explained the importance of introducing the essence or purpose of our practice, possibly touching the history of Shintaido, how it was developed, etc. briefly. Then one method would be to introduce all the 3 fundamental techniques, which are Tenshin goso, Eiko and Wakame or Hikari, whereas the other method is to focus on only one of the 3 fundamentals. Having asked Pam and myself for ideas on how we should approach a group of performing arts students who would be attending the workshop, he shared his teaching plans, which were very carefully thought through, and at the same time keeping flexibility with several options to choose from depending on the group of participants. On Sunday morning, Adam met us at the workshop venue, – a brand new performing arts studio in Plymouth University. Our Shintaido workshop was to be the first ever activity to be held in this new space. When I stepped into this studio, I sensed a special atmosphere as if I were in a Japanese Budo-jo (martial art hall). Minagawa sensei spontaneously performed a cleansing ceremony with his sword, facing to each of the 4 directions in the space. He then asked me to do Tenshingoso afterwards. Gradually participants who were mostly Adam’s students on the Performing Arts programme started to arrive. We formed a circle and introduced ourselves by speaking our names, then the rest of the group greeting us back “Konnichiwa (Hello) ______san!” This broke the ice. Then Minagawa sensei explained the purpose of our practice, using the Japanese expression, “There are no enemies.” One way to achieve this would be “To kill all enemies” – which is the way of combat, “Hei – Hou” (兵法). And he suggested that there is another way to achieve this condition, that is “to make friends with everyone” – the way of peace, “Hei-Hou” (平法), a word with the same pronunciation as the above, but with a different character! He left it open saying that it is up to each of us to decide which way we choose. After the dynamic and joyful warm up including flying boomerang by jumping up in the air, Minagawa sensei introduced Samurai Walk, transformed Kaikyaku dai movement, opening chest and arms using voice “Ha, Ha, Ha!” stepping forward and backwards. Then in pairs facing each other, they explored the Ma “space between”, Kokyu “breathing”, and Hyoshi “rhythm” with their partners. It was lovely to see these young people get straight into this new movements without any hesitation! Then we showed basic cutting movements with a sword and the participants practiced Toitsu kihon cutting movements with open hands. Minagawa sensei praised them all when they did Chudan Kiriharai (middle level pulling cut) with Fudo dachi stepping so well. We moved onto Chudan tsuki (middle level thrust) starting with one count one thrust, and gradually one count to 2 thrusts, 3 thrusts, then even 1 count 10 thrusts with Kiai voice in the end. By this time, they all looked energised and they were ready to do hall length running tsuki with voice “Eh — i!” several times. At this point, Minagawa sensei explained the history of Karate development, how punching with a fist has transformed to open hands through pursuing the most effective technique in Karate. It also gave participants time to catch their breath while listening. The next moment, hall length Eiko using “open hands” were introduced which they all did naturally, and took another step of demonstrating Eiko dai in pairs, running /circling the whole studio with full power! It was very moving to watch their Eiko running. I felt that this brand new dojo was filled with life, light and love. After a short break, Tenshingoso “Cycle of Life” was introduced and Minagawa sensei explained that this fundamental form contains the essence of martial arts, expression arts and healing arts. Then the students first focused on learning movements by watching and coping. After that, the sound “A, E, I, O, U” was introduced while they were watching the movements demonstrated. Finally, they combined the movements and sounds together, which I found was a very effective way of introducing Tenshingoso. Finally, Minagawa sensei asked the students if they wanted to practice the advanced technique, which all said “Yes!” to. He then introduced the history of Wakame (seaweed) exercise, how it had been developed from Renko practice, (attacking by thrusting and receiving continuously), transformed to non-confrontational, soft, fluid and meditative movement. The students did this exercise beautifully, and they looked calmed down, grounded and centred at the end. Enjoyed and would like to do it again. Felt energised and relaxed at the same time. Enjoyed using voice and movements. After the events, we realised that British Shintaido had its 40th anniversary last year, which is exactly 10 % of 400 years of Anglo-Japanese relations! That actually felt like quite a significant achievement. I believe that through this first important ground work, Shintaido has been rooted deeper and deeper into the British soil and now BS is ready for the next stage of the development, growing towards the sky, spreading our branches which will bring blossoms in spring.